To realize working possibilities with children of autistic spectrum and other Developmental Disorders peculiarities. Every partner of the project brought a certain number of participants to attend the training. All partners were asked to complete an online questionnaire provided online through the use Google Forms after C1 trainings in Lithuania, 12 of May, 2017. Questionnaire was not anonymous and 14 open questions. We sent 46 questionnaires, returned 38 answers. The questionnaire aims to find out about: the benefits of the training, the organizational aspects and suggestions for further communication. It was asked what institution you work, those replying working in school for children with Special Needs, High school and Noimathisi institution of special education and kindergarten. Most of the responses are employee (28), volunteer (10). In your opinion, what was the most useful subject in Vilnius training? Symbols, schedules and rules importance of working with children with autism and other disorders features, behavior changes. In your opinion, what was the most useful experience in Kuršėnai kindergarten “Eglutė”? Listen experience from teachers how they work with children ­ the presentations of the specialists and the practises that were shared with us; the visual work with ABA therapy elements. To see kindergarten „Eglutė“ institution, class, work tools, childrens, toys. Facilities, the work methods and techniques used. Beside, we could compare the differences between our association and this kindergarten and take notes about how improve our services. Present institution of Lithuania kindergarten. Communication with different people, specialists and teachers. Which elements you could use in your work position? Results verification, generalization, symbol pictures and sand therapy. Also new schedules, new sensory material, new record sheets. Use the ABA principles and method frequently. Use ideas on how to organize the child’s information when giving a therapy: make a table in which to indicate: objectives, problem behaviors, possible solutions to these behaviors, reinforcements, generalization form. In your opinion what could be useful for your colleagues in your educational environment? Practice in special education needs can be increased. To reflect on acquired knowledge, methodologies and strategies adopted. Carefully design each step of the educational action to achieve the goals set. Try to communicate with quiet students and try to find a way to communicate with the experience through this training. Continued support, teamwork, supervision, as well as discussion could be useful in any educational environment. More structure, more reforceiments, and new kinds of record. Use different paths for the different needs of autistic students. ABA therapy elements will benefit in direct work with autistic children as well as other children with communication problems. Useful the implementation of an improved agenda of which we have, adding a personalized agenda per child. Besides, could be useful an increase of the hours that children stay in our institution, so we can have more time to work with them. Participate in the project in order to advance knowledge and be able to adapt the work with children. What was new for yourself? How to work with ABA therapy, practical use of the ABA method. New experience from different country and teachers, school organization, new methods of work, people, different ideas. The facilities of the special kindergarden and the combination of the methods used and some of the ways of stimulating the learning process ­the emotional contact between the therapist and the child, the small awards (candy). The novelty concerned the detailed programming of the objective with greater focus on clean language. Special school organization in the other countries. Classroom space and the teaching materials. Diagnostic procedure at the university (add ­ Siauliai University). New forms to apply PECS method, how to work with symbol system. How did you feel working in groups? All colleagues felt good and positive. They loved to share experiences, ideas, knowledge and find common solutions. Everybody liked working groups. 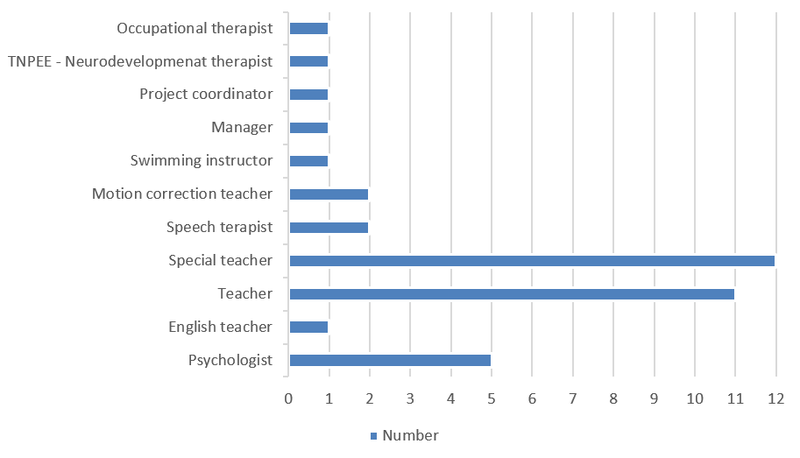 Most respondents plan to share experience is Social media (Facebook, website of the school, Parents’ association “Cooperation” National Association of Special Teachers, kursenueglute.lt, http://aba­onv.eu/, https://www.facebook.com/ABA­ONV­253676035094164/). Organizing a presentation in institution for colleagues in work, other specialists and seminar for parents with autistic children. Speaking of experience in the next meeting of Foreign Languages Department. In your opinion, what do you suggest for the organization? To spread the experience of the project and to improve language skills in English. To compare all the participants about how they work in their country with ABA and autism. Should be more practice provided and spend more time on the training about socialization of children with autism. One suggestion is to send the slides of the presentations to read them before the talk. This can favor participation, since reading them carefully later understanding is greater and can be carried prepared some questions that generate doubts when you read it. Suggest more practical activities in the the classroom. Would be useful if there were more visits to schools, as well as the monitoring of a real time conference in any institution. Would like more information and messages from partners. In your opinion, what are suggestion for further cooperation? The desire to have more knowledge about other projects and the ability to cooperate. Exchange of information, ideas, experience, new studies of each country. To give more multimedia and less theorical information, and show a little more the work with the kids and more meetings. Would be very interesting to continue the experience in order to show the method of work In Italy in every grade of school. Any training about the interventions used in special education (autism, dyslexia, dyscalculia, ADHD) could be use for further cooperation. Would have liked to have more information about the project before going to the country outside for we can prepare material well before and now, I would like to have information about others projects. More close cooperation. Traveling and meeting new people with common professional goals enriches our working experience. More practical activities than theory. Would like English language training, because lack of language knowledge. Trainings realised goals of C1 activity as were shown working possibilities with children of autistic spectrum and other Developmental Disorders peculiarities. Were organized trainings to show ABA method use possibilities, ABA element use in special kindergarden “Ciauskutis”, other practice how work with autistic child in Siauliai University, Kursenai kindergarden “Eglute”, presented and other teachers from Siauliai region educational organizations. Participants identified new things for them it was: working in mixed groups, share of experience. Also ABA use practical expamle, new forms to apply PECS method and other symbols; special school organization, classroom (add ­ group ­ as we were in kindergarden) space and the teaching materials. Also diagnostic procedures at the Siauliai University. And the novelty concerned the detailed programming of the objective with greater focus on clean language. Praticipants will disseminate trainings experience throuth organizational websites, social media, meetings. Elements, most suitable for participants involvement in work position are: to set goals, plan of steps, use prompts; organization of spaces. Results verification, generalization, symbol pictures and sand therapy use. Also new schedules, new sensory material, new record sheets. Use ideas on how to organize the child’s information when giving a therapy: make a table in which to indicate: objectives, problem behaviors, possible solutions to these behaviors, reinforcements, generalization form. Strategies adopted, visual tasks. Theory was mixed with practical tasks, but as seems from participants suggestions, they were willing for one more practical tasks, more practical experience show in educational organizations. Interesting, that participant didn’t mentioned parents inclusion importance. Maybe it wasn’t new or is strong part in their organizations.